After over a decade, the world-renowned, multi award-winning graphic novel series, Les Cités Obscures (The Obscure Cities) returns to the United States with The Leaning Girl, a classic story translated into English for the first time. 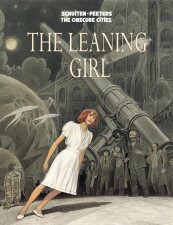 Originally published in French as L’enfant Penchée by Editions Casterman in 1996, The Leaning Girl is now available in English thanks to the efforts of author and translator Stephen D. Smith who secured the rights to, translated, and published the book under the watchful eyes of author Benoît Peeters and artist François Schuiten, the creative team behind the The Obscure Cities series. Following the successes of Pulitzer prize winner, Maus by Art Spiegelman, Persepolis by Marjane Satrapi, and The Invention of Hugo Cabret by Brian Selznick, the graphic novel has become an accepted literary form. The Obscure Cities features captivating Kafka-esque storytelling by internationally acclaimed author and biographer, Benoît Peeters, and stunning artwork by François Schuiten, whose visual sensibilities contributed to the looks of such films as Taxandria, The Golden Compass, and the 2012 science fiction cult smash, Mars & April. The book, printed in Italy at the same facility responsible for printing the original French edition, measures an oversized 9.25″ x 11.625″ and has a 176-page count including 5 pages of never-before-seen sketches and layouts. The standard edition of the book is the trade softcover featuring deluxe cover flaps proving a more sturdy and durable package. In addition, there is a deluxe hardcover edition of the book, limited to 500 numbered copies, signed by Benoit Peeters and Francois Schuiten on a bound-in color bookplate. This edition, over half sold-out, is only available through the store on the obscurecities.com website. The Leaning Girl is the first graphic novel to be produced under Smith’s new imprint, Alaxis Press, and is available now through the obscurecities.com website and select comic shops and booksellers. In conjunction with this publishing milestone, San Diego Comic Con has announced that the author, Benoît Peeters, and the artist, François Schuiten, will be international guests of honor at the 2014 summer convention.